List Rules Vote up the best lip sync battles. Fans love it when celebs act like normal people. But they like it even more when their favorite famous faces try to act like rock stars. Thanks to their choreographed (or spur of the moment) dance moves, obscene wigs, and guest appearances, all of the lip sync battles on this list are truly epic. The country's obsession with lip syncing has now taking over TV. Jimmy Fallon regularly challenges his guests to (pretend) belt it out on The Tonight Show, and Spike's smash hit Lip Sync Battle has managed to snag some of the biggest names in the world (ahem, BEYONCE) - though there are still some celebrities we'd love to see on Lip Sync Battle. One of the most epic celebrity lip sync performances came from Emma Stone on The Tonight Show. Blues Traveler's "Hook" will never be the same. Another insane showing? Channing Tatum's performance of "Let it Go" during Spike's Lip Sync Battle (or that time he had Yonce join him on stage). Speaking of Queen B, the world can never un-see Will Ferrell's Beyonce impersonation. But who would want to? These best celebrity lip sync battle videos, for you to watch over, and over, and over again. Upvote the celebrity lip sync battle you think is the MOST epic! Anne Hathaway "wrecked" Emily Blunt's "Little Piece of My Heart" when she performed Miley's "Wrecking Ball" on Spike's Lip Sync Battle. 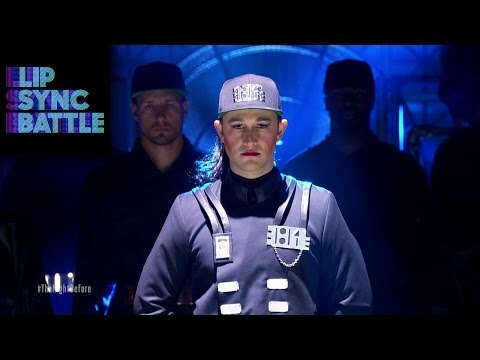 Joseph Gordon-Levitt donned a full ponytail wig for his performance of Janet Jackson's "Rhythm Nation" on Spike's Lip Sync Battle. Anthony Mackie's "Can't Touch This" couldn't... well, touch it. The Tatums went head-to-head on Spike's Lip Sync Battle. Jenna nailed her "Cold Hearted" Paula Abdul moves, but they're no match to Channing's "Let it Go," complete with costume. Anna Kendrick shook John Krasinski right off the stage when she performed J. Lo's "Booty" on Spike's Lip Sync Battle.